Aqua, Propylene Glycol ,Glycerin, Cetyl Alcohol, C12-15 Alkyl Benzoate, Stearyl Alcohol, PEG-100 Stearate, Glyceryl Stearate, Aloe Barbadensis Extract, Chamomilla Recutita Extract, Menthyl Lactate, Cetyl Lactate, Cocamidopropyl PG-Dimonium Chloride Phosphate, C12-15 Alkyl Lactate, Dimethicone, Sodium Isostearoyl Lactylate, Propylene Glycol Isostearate, Cyclohexasiloxane, Cyclopentasiloxane, Alcohol Denat., Isopropyl Alcohol, Myristyl Alcohol, Palmitic Acid, Salicylic Acid, Stearic Acid, Carbomer, Acrylates/C10-30 Alkyl Acrylate Crosspolymer, Sodium Chloride, Disodium EDTA, Sodium Hydroxide, Lactic Acid, Benzalkonium Chloride, Methylparaben, Propylparaben, Ethylparaben, Phenoxyethanol, Parfum. I've used this moisturiser previously for quite some time. It worked well to help manage my acne, although didn't clear it. It leaves the skin feeling very hydrated, although the skin appears quite oily. At the beginning I liked this product until I got very dry itchy spots all over my face and rash around the mouth and nose... The product felt good and refreshing and the smell was ok but I can't use this product so I have to give 1 out of 5 stars... The product contains also parabens which are not good for you! I have always avoided moisturisers as my face is soooo oily and to be honest thought it would make it worse.After using topical treatments for my acne my face just looked dull and lifeless so I thought I would give it a try.I feel like this makes my skin feel so soft and reduces a lot of redness.I wouldn't say it does anything to clear my skin maybe a tiny bit but defo worth getting because it does bring a bit of life back into dull skin and even out your skin tone. I use this moisturiser as a base before foundation as it has a thick consistency that isn't greasy. It absorbs fast and leaves a soft, slightly tacky texture on the skin. Skin doesn't look shiny or have that slippery feel many moisturisers leave behind on your skin. It blends well with my foundation (EstÃ©e Lauder double wear) and a multitude of primers. It doesn't break me out and my skin is left feeling healthy. It also speeds up the healing of squeezed/picked spots but no more than any standard moisturiser would. 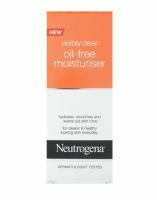 I only gave it three stars as I use another oil free moisturiser by clean and clear that contains sacylic acid which helps keep small pimples at bay, whereas this moisturiser offers little in terms of spot reduction or prevention. Would recommend if you're struggling to find an oil free moisturiser that's compatible with makeup! I have been using this moisturiser for about a year. 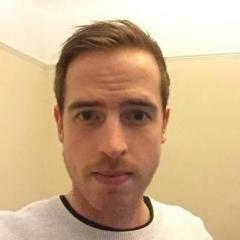 During this time I went through a 5 month course of Roaccutane ( I am almost 2 months off, and so far so good.) My dermatologist told me that it didn't matter WHAT product I choose to use on my face, as long as it was marketed as OIL FREE. He mentioned this product and the first thing I did was buy it! So far it has been a worthwhile choice and it is reasonably priced. I use 100% soap free Simple facial wash (or sometimes Cetaphil) , followed by Neutrogena Visibly Clear Oil Free Moisturiser** and I find that this combination works well for me. **I have used the same product with SPF in, but this stings my eyes.